With the passing of Bill 21 in November 2018, the Health Professions Act (HPA) was amended to require increased transparency from regulatory colleges in Alberta. These amendments require mandatory publication of sexual abuse and sexual misconduct disciplinary actions. The College of Licensed Practical Nurses of Alberta (CLPNA) understands that public disclosure beyond the mandatory requirements of the HPA can educate the public and its members (registrants) about conduct and regulatory processes, while increasing public confidence in the profession. Therefore, all complaints and disciplinary proceedings will be published on the CLPNA website after April 1, 2019. 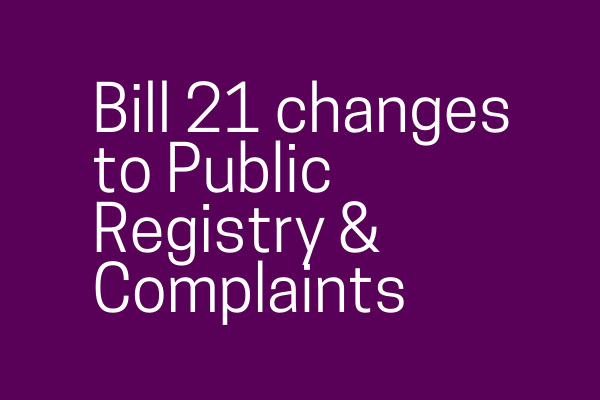 The CLPNA is updating its Public Registry of LPNs and complaints webpages to meet these new requirements. Currently, the Public Registry of LPNs lists the member’s name, registration number, registration type, Practice Permit effective and expiry date, authorization for specialized practice and conditions on practice. As of April 1, 2019, the Public Registry will also include the status of a current and former member’s Practice Permit (active, suspended, cancelled, limited, or associate). If a Practice Permit is listed as suspended or cancelled, the Public Registry will also state a reason. These changes are new to the registry, although they are not foreign terms utilized in the HPA. Suspended = Not authorized to practice as an LPN in Alberta as Practice Permit is suspended. This registration type includes reason codes. Cancelled = Not authorized to practice as an LPN in Alberta, as Practice Permit and registration is cancelled. This registration type includes reason codes. All information about complaints of unprofessional conduct against an LPN is confidential until it is sent to a formal disciplinary Hearing. Findings of unprofessional conduct based on sexual abuse or sexual misconduct are required under the HPA to be published indefinitely, while all other findings of unprofessional conduct will be published for 5 years. Decisions that have been appealed or under appeal will remain on the website with a clear indication of its status. Any sensitive or confidential information in the Hearing Tribunal Decision will adhere to privacy and other legislative requirements.